Get free labor on your change oil when you bring a minimum of 4-liter G-Tech or 6-liter D-Tech specially marked Prestone Motor Oils at select Rapide outlets. Cost of oil filter and other incidentals is not included. 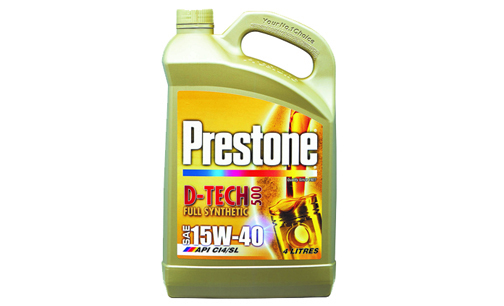 G-Tech Full Synthetic, which is made for gasoline-powered engines, is Prestone’s mineral and synthetic blend. It uses hydrocracked base oil with a core additive for better engine performance. G-Tech Advance also improves piston cleanliness, delivers better fuel efficiency and lowers oil consumption. D-Tech 500 Full Synthetic is universal heavy-duty diesel engine oil that brings American and European standards to meet the requirements of API, CI-4, ACEA E7, MB 228.3 and the stringent Global DHD-1 specifications. Promo runs until March 15, 2019. For more details, visit Prestone Philippines Facebook page.